As we all know I love setting myself a challenge and whilst I fail more than I flourish I can't help trying. My mum will tell you I am very trying so it must be true. I've always struggled to grow my nails, that's not strictly true. I can grow them but I'm also fond of biting them. I do it when I get frustrated, bored, stressed. The stop biting solutions have never really put me off and I can put up with the taste. Another issue I have is that I can't seem to keep polish on my nails, I don't know if my nails are really acidic or what but polish usually seems to melt off my nails if it doesn't chip first. That's with using base and top coats. In the past year, I've gone down the route of home gel nails but I'm not very neat and I tend to pick them off but I have discovered Kiko's nail polish works on my nails and I have been using this but as my nails are so short I don't really like the look of coloured nails. Which brings me back to the point of this post. I want to grow my nails and keep them in good condition. I've recently re-discovered Simply Nailology on YouTube and I've been binge watching Cristine's videos. He nails are lovely and long (too long for me, but I still have nail envy) she has a few videos on growing nails and I love how down to earth and realistic she is. There are a lot of hacks and quick fixes to try and say you can grow long nails in a week but really unless you have super speedy genes then it's not gonna happen. 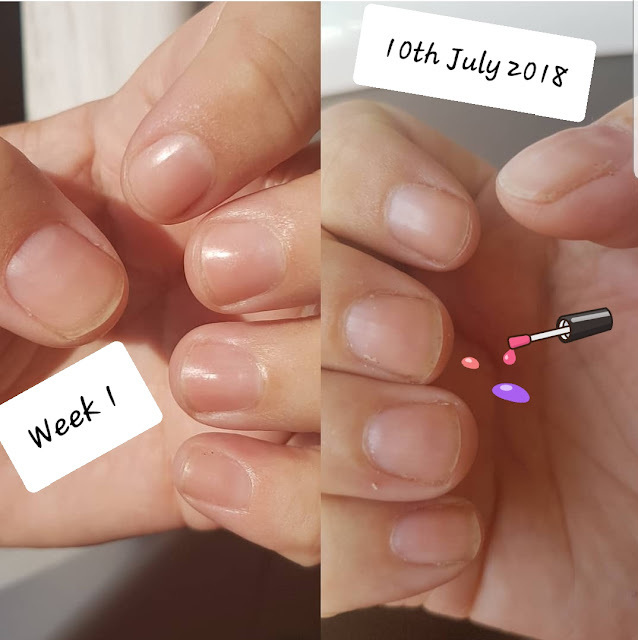 I always feel like my nails are weak and need a strengthener but from watching Cristine I probably don't the strengths can make nails tough and easier to break if you know the nail. What I need to do is stop picking polish off my nails and biting them. 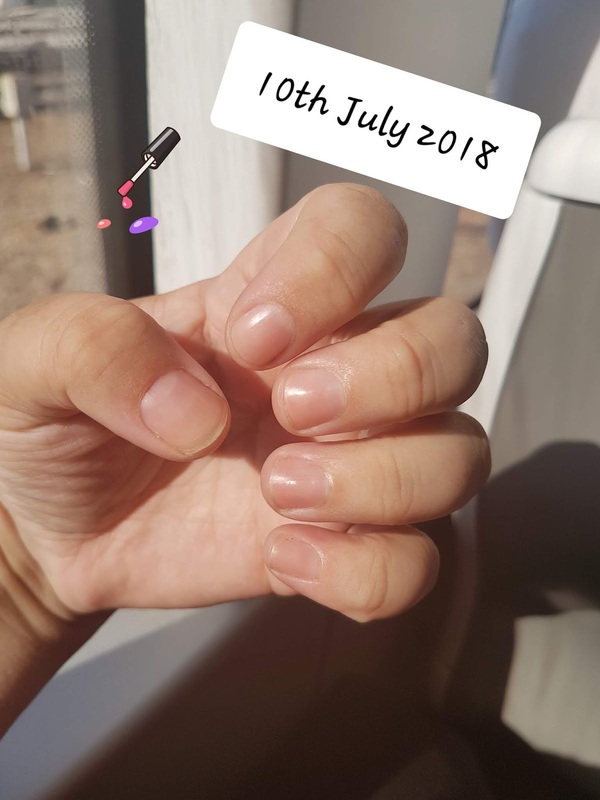 These are my nails on what I'm calling day 1 and I'm hoping to take pictures weekly but probably won't do weekly updates, nails grow slowly. Next weeks pictures probably won't look any different. The tips in the videos are not rocket science and make a lot of sense to me. The main ones I'm taking away from them is to use a nail oil and she found Jojoba works best. I have bought some oil which contains this but isn't 100% so I've got some in my amazon basket to buy on payday and I'm also using a scholl nail oil I got when I bought one of the pedi machine files for my feet. Her tip was to apply as often as possible. I've been applying oil 2- 4 times a day. I'll do another post on products once I've taken some photos. The second thing I've taken away is not to have naked nails, to have something on them at all times. Since the picture was taken I've applied at home gel base coat and top coat. I've not gone for a colour as I wasn't to keep it simple for now. As well as always have something on the nails is to apply it neatly. I've always been someone who gets more polish on my hands than nails so I've been taking my time to clean around the nails while the polish is wet and I've ordered some nail art brushes for a couple of pounds from Amazon to help with cleaning around the nails. I used an old makeup brush this time and it wasn't great. It's only been 2 days but on my left hand, I can see some growth on my ring finger nail and my pinky fingernail. 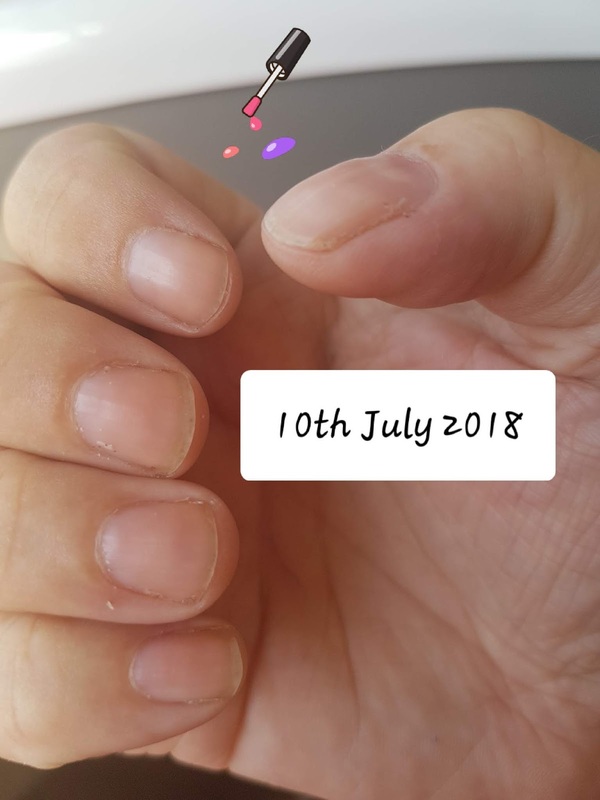 I'm not doing anything else really other than trying to push back my cuticles gently filing every other day to start to shape the nails slightly.